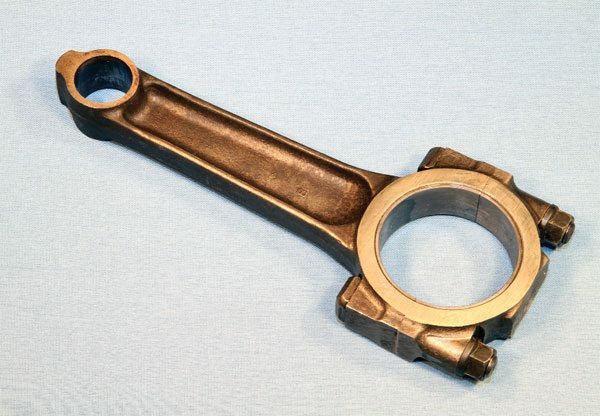 A connecting rod may be the most highly stressed component in an engine. Essentially in constant motion during normal operation, it’s designed to endure compressive loads and change direction nearly instantaneously, and the inertial force upon it increases with engine speed. A connecting rod for a particular application must be constructed of a sturdy material that’s elastic enough to not fatigue. There are two types commonly associated with Pontiacs: cast and forged. 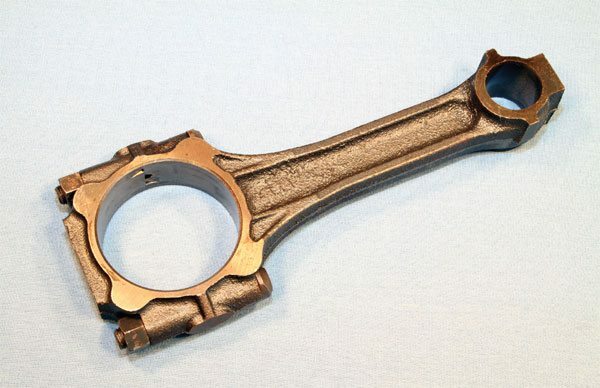 The most common Pontiac connecting rod is the cast unit constructed of Armasteel, a specific iron alloy that boasts some steel-like qualities. While suitable for a mild performance rebuild, entry-level, stock replacement forgings are a much better option, particularly anytime performance is increased beyond stock levels. 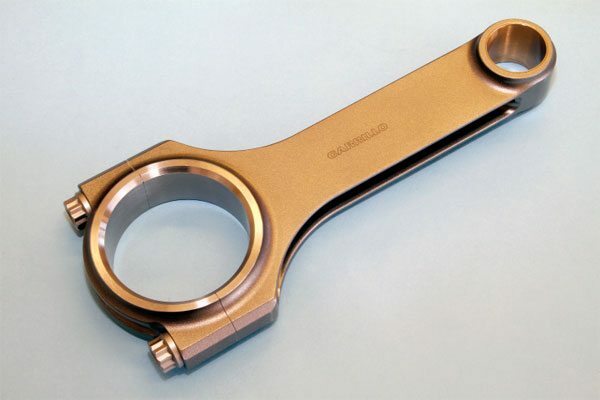 Cast connecting rods are very cheap to produce. Cast iron is generally very strong up to its elastic point, but tends to shatter once surpassed. 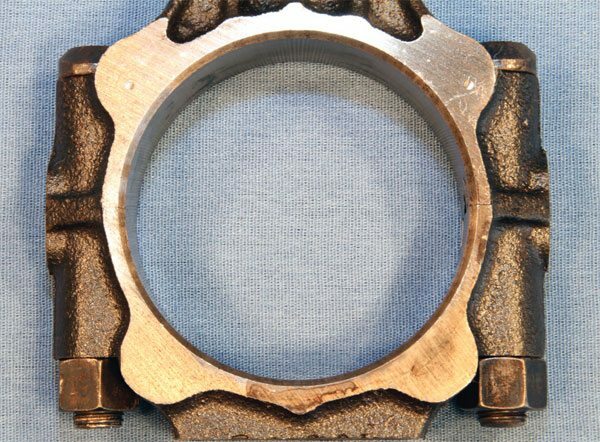 A properly designed cast connecting rod can provide a long service life if an engine is operated within its intended limit, making it ideal for production engines. Steel forgings are durable but somewhat expensive to produce. Heat treating to a specific hardness is required to survive the greater inertial forces associated with power increase and/or high engine speeds, making it even more costly. Depending upon the year and/or engine application, Pontiac used cast or forged I-beam connecting rods. A lowgrade forging with minimal heat treating was used early on, and it wasn’t dimensionally stable. During the 1960s Pontiac introduced a strong cast unit constructed of Armasteel, a GM trade name for a pearlitic malleable iron alloy that possesses some steel-like qualities. Because of age, stability, and durability concerns, I strongly feel that neither of these original Pontiac rods should be used in any high-performance engine. Pontiac developed a beautiful forged-steel connecting rod for its Super Duty 455. The high-quality forging is constructed of premium steel, uses 7/16-inch fasteners, and is heat treated for maximum durability. Very expensive when new, SD-455 rods remain quite valuable and are suitable for high-performance use. Modern 4340-steel forgings may be a more affordable option, however. 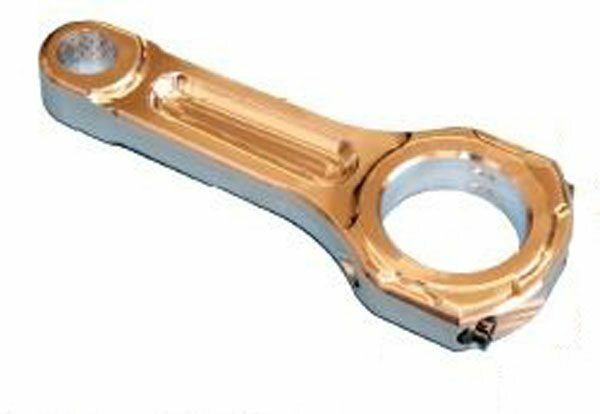 Many connecting rod manufacturers offer a variety of options aimed at improving reliability in specialized applications. That includes this hole that provides additional wrist pin oiling via crankcase splash. Another popular option is a passage drilled through the beam that provides a direct supply of pressurized oil to the wrist pin for applications with extreme cylinder pressure. Pontiac used high-quality steel forgings in its max-performance efforts such as the Super Duty 421 and Ram Air V, and they are extremely rare and difficult to find today. The 1973–1974 Super Duty 455 used a completely new forged-steel connecting rod for maximum durability. The specialized forging and finishing process was outsourced to Teledyne Continental Motors in Michigan. Orders from racers for the premium stock-length rod poured into the Parts Department, and at one point Pontiac reported more than 1,300 orders at one time. Once Pontiac discontinued the SD-455 after the 1974 model year, its forged-steel rod was produced and remained available through Pontiac’s Parts Department on a limited basis for several years. The rods were so rare and costly that many couldn’t afford them, however. While new old stock (NOS) and used SD-455 rods appear for sale from time to time and are certainly suitable for a modern high-performance build, they remain very valuable. For the total cost involved I believe there are more affordable options on the aftermarket. Eagle Specialty Products gave Pontiac racers the durability they desired but couldn’t otherwise afford when it introduced its high-quality 4340-steel forging in the mid 1990s. A great number of forged-steel connecting rods for Pontiacs followed and there is a wide variety available on the aftermarket today. Be sure to discuss your build plans with your Pontiac engine builder or parts vendor to determine which connecting rod is best suited for you. 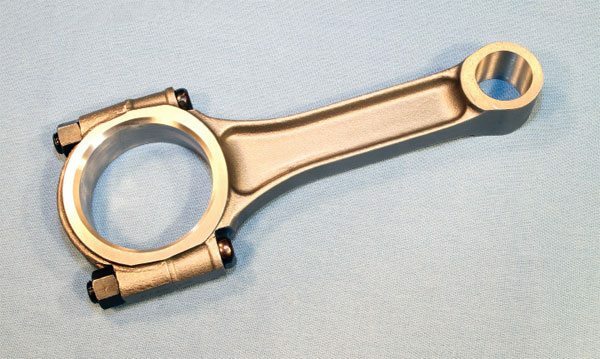 RPM International offers a stockreplacement Pontiac connecting rod constructed of 5140-steel produced at its China-based facility. The new I-beam features stock Pontiac dimensions and 7/16-inch-diameter bolts. It’s an excellent and affordable alternative to reusing cast originals in any performance engine generating up to 500 hp and/or a maximum engine speed up to 6,000 rpm. Available from most major Pontiac vendors and marketed under various names, a complete set sells for less than $250. Within the past few years, RPM International introduced its stock replacement forging for Pontiacs. Constructed of 5140-steel, the I-beam features the same dimensions as a stock cast rod, but is rated up to 500 hp and 6,000 rpm. A complete set sells for about the same price as reconditioning eight cast stockers, making it a very popular performance value. 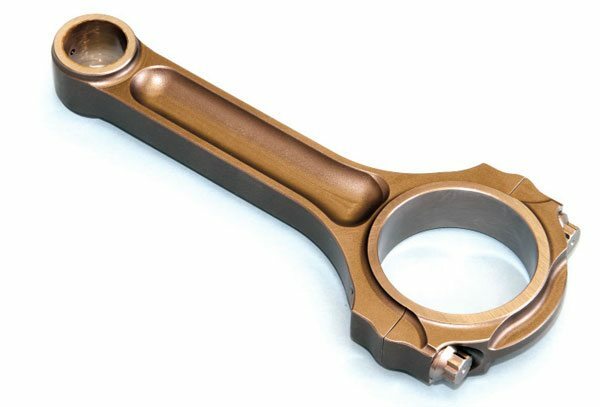 Along with its popular forged-5140 I-beam, RPM International also offers two 4340-steel connecting rods for engines producing up to 800 horsepower. Available in either H- or I-beam designs, and in stock dimensions or for stoker applications, the rods are an excellent choice if you’re building a performance engine on a budget. Steel alloyed to 4340-spec offers excellent endurance qualities and is often used to produce high-strength connecting rods. I strongly recommend upgrading to forged-4340 rods in any engine producing more than 500 hp. Several companies produce forged-4340 rods specifically designed for the Pontiac V-8 applications, and RPM International is among them. Its 4340 I- and H-beam connecting rods are a popular option for engines producing up to 700 hp or slightly more. Its lightweight I-beam variant, called Maxx Lite A-beam offers similar durability. Eagle’s original forged-4340 H-beam remains very popular with Pontiac hobbyists. Eagle rods are finished to precise standards that result in better consistency and reliability. 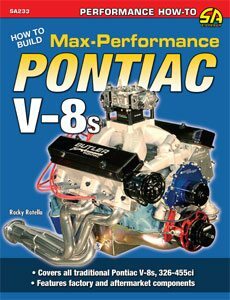 Selling for about $550 per set, it’s an excellent choice for Pontiac engines producing up to about 750 hp and turning 7,000 rpm. An available fastener upgrade can increase that toward 1,500 hp. Eagle introduced one of the first affordable forged 4340-steel connecting rods for Pontiac V-8s during the 1990s. An excellent value and quite durable, the H-beam is very popular with performance enthusiasts. Available with stock Pontiac dimensions with pressed-fit or floating wrist pins, Eagle also offers a wide array of dimensions for stroker applications. Crower introduced its Pontiac-spec Big Block Sportsman rod around 2000. Produced in America and constructed of 4340-steel, its unique I-beam design offers excellent strength and durability. It’s popular with serious performance enthusiasts for engines producing up to 1,000 hp and turning as much as 8,000 rpm. A complete set sells for less than $800. 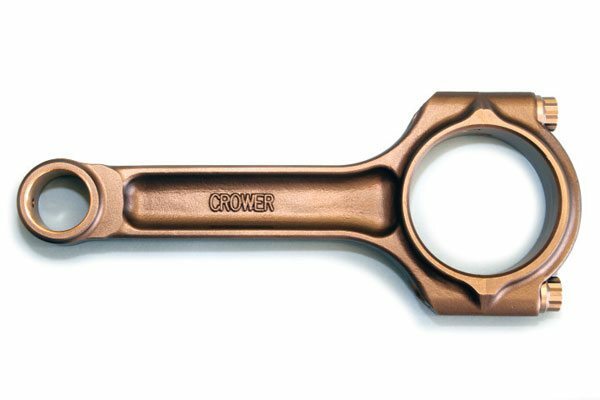 Crower supplies the hobby with many quality valvetrain components, but its Sportsman Big Block series connecting rods for Pontiac V-8s are considered among the best available today. Constructed of forged 4340-steel, the I-beam design offers excellent strength. They are available with pressed-fit and floating wrist pins and in popular stroker lengths too. CP-Carrillo’s Pro-H series rod is among the most durable Americanmade options available today. Its standard H-beam, which is constructed of 4330-spec alloy is suitable for engines producing 1,000 hp and turning as much as 8,500 rpm, and fastener upgrade increases that to 1,300 hp and to as much as 9,500 rpm. CP-Carrillo can produce custom rods for engines producing 2,000 hp or more. Expect to spend around $2,300 for a complete set. CP-Carrillo produces a number of premium forged-steel connecting rods that are compatible with the Pontiac V-8. Its proprietary H-beam design offers excellent durability for most severe applications. 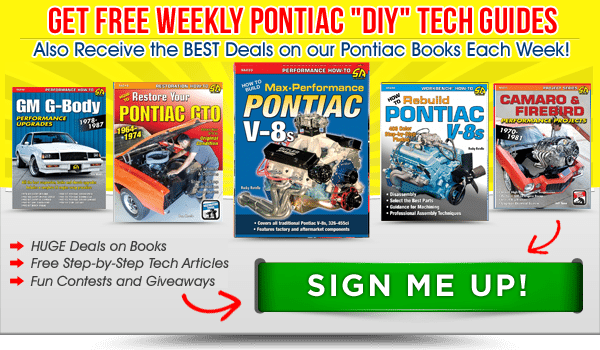 It also produces an NHRA-approved Pontiac rod, which features an overall length of 6.635 inches, but uses a 2.2-inch connecting rod journal and .990-inch diameter floating wrist pin. Oliver is another premium connecting rod manufacturer. Its American-made rods are CNC-machined from a billet of 4340-steel. The unique I-beam offers a great deal of strength for its weight. Oliver rates a typical Pontiac-application rod up to 2,000 hp or slightly more, and it can accommodate any custom specification. Expect to spend at least $1,300 for a complete set of Oliver rods, and as much as $1,800 for a set of custom units. When it comes to steel connecting rods for a max-performance Pontiac V-8, Oliver’s billet I-beam may be the best. Available in a wide variety of length and crank and wrist pin configurations, Oliver’s rods are the choice of many professional Pontiac builders for high-end applications. Since aluminum weighs less than steel, an aluminum rod can be made much beefier than a similar steel rod without the negative effects of excessive weight. This greatly improves durability while the lightweight construction reduces rotating mass, which can allow an engine to accelerate quicker, most likely improving performance. The soft aluminum absorbs compressive shock loads. While that can lengthen cast crankshaft and/or bearing life in extreme applications, it, along with heating and cooling cycles, causes the aluminum to work-harden over time, making it very brittle and potentially shatter. Replacement is eventually required, and that could be 50 drag strip passes or 500, depending upon the particular application. That makes aluminum rods very impractical for a street engine, and though some have successfully done so, I don’t recommend it. They are best suited for race engines that are torn down for freshening at regular intervals. GRP produces a premium billetaluminum I-beam rod that’s suitable for a max-performance Pontiac V-8, particularly one that operates at very high RPM or uses forced induction. 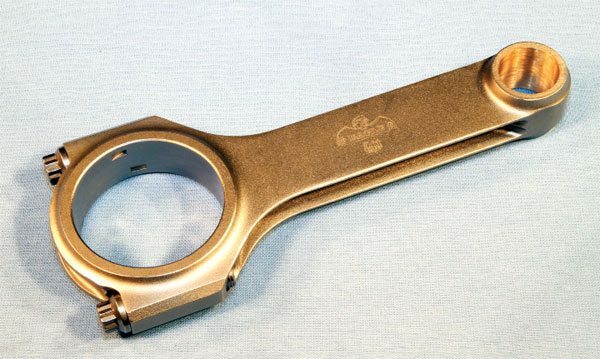 Weighing about 200 grams less than a similar steel unit, the GRP custom connecting rod for a Pontiac engine turns up to 8,500 rpm and produces as much as 1,200 naturally aspirated horsepower or up to 1,800 with a power adder. GRP can produce rods for engines with much more horsepower on a custom-order basis. Expect to spend around $1,200 per set. 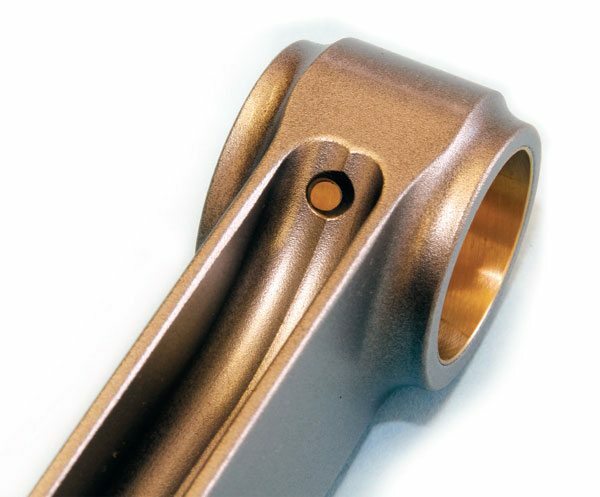 GRP produces some of the best billet-aluminum-alloy connecting rods available today. In addition to weighing substantially less than steel, aluminum also acts as a shock absorber between the piston and the crankshaft. This is particularly beneficial in applications where very high cylinder pressure exists. Aluminum fatigues and cracks over time, however, and rod failure is quite possible if the entire set isn’t periodically inspected or replaced. For the alloy used in its rods, GRP typically recommends allowing around .010 inch more deck clearance when compared to steel forgings, and an additional .001 inch of side clearance. That amount may vary with other aluminum rod manufacturers. The stock Pontiac block’s relatively tall deck height allows the use of a rather long connecting rod with a center-tocenter length of 6.625 inches, producing a good rod-to-stroke ratio. A long-length rod tends to lessen the amount of side load placed on the cylinder wall, reducing cylinder wear and operational friction associated with a 90-degree V-8. A common modification in modern performance rebuilds is to use a rod measuring 6.7 to 6.8 inches long. That length is specifically chosen for a few distinct reasons. It improves the connecting rod to crankshaft stroke ratio beyond stock, further reducing the significant cylinder wall loading that can occur when using an aftermarket crankshaft with a stroke length that’s greater than 4.21 inches. It is also a length common to big-block Chevy applications, and easily fits into a Pontiac block. It does, however, typically require a corresponding piston, and crankshaft rod journals undersized to 2.2 inches. 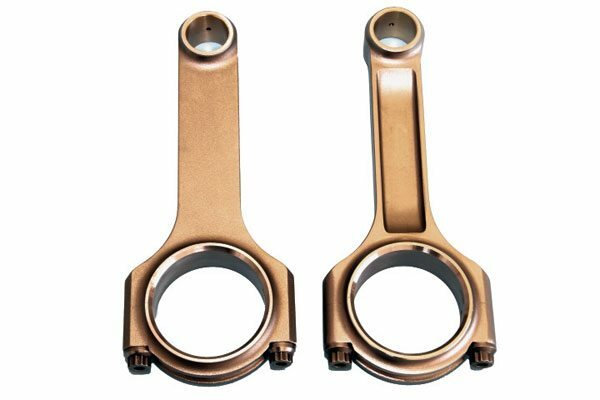 To positively locate the connecting rod body and cap, and to prevent the components from “walking,” premium aluminum connecting rods feature radial serrations, such as those found on the GRP aluminum units. Aluminum connecting rods are not compatible with press-fit wrist pins. The aluminum alloy such rods are typically constructed of generally makes an excellent bearing surface. 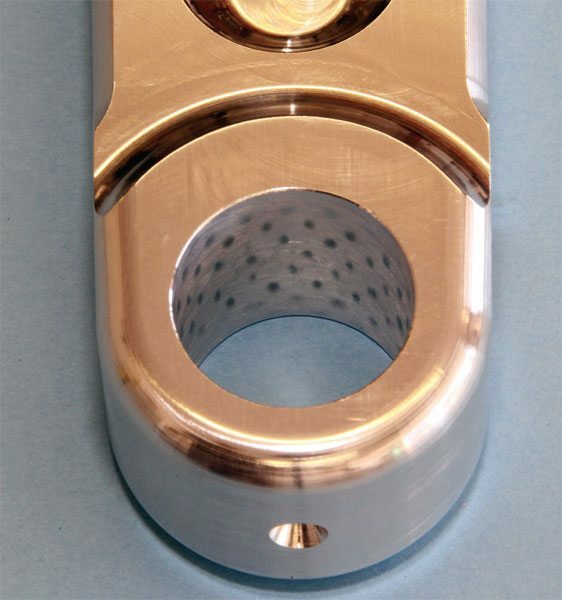 Additionally, the thermal expansion associated with aluminum makes it difficult to retain a bronze bushing. By itself, I don’t believe there’s a measureable performance difference by simply increasing rod length from the stock dimension of 6.625 to as much as 6.8 inches. It does, however, allow the use of shorter, lighter-weight pistons, and does slightly decrease piston speed, and that’s where its performance benefits may come from. A connecting rod fastener is designed to provide a specific amount of clamping load and secures the rod cap to the body. That force is applied by stretching the bolt a very specific amount. Fastener manufacturers can accurately predict the amount of bolt stretch by how much torque is applied to it. While that’s an acceptable method for most other fasteners, connecting rod bolt stretch can be precisely gauged using a specially designed fixture that measures a bolt’s length from each end. New rod bolts are commonly torqued to spec without measuring and/or affecting reliability, but measuring stretch is preferred for competition engines. During teardown, I highly recommend physically measuring a used rod bolt’s length fully torqued and in a relaxed state. By comparing your recorded measurements to the fastener manufacturer’s stated tolerances, you can assess a bolt’s condition to determine if it’s reusable. Keep in mind that a variance as small as .0005 inch can be the difference between reusing and replacing, so accuracy is extremely important. Any fastener applies maximum clamping load when it’s stretched to a particular length. Stretch is often estimated by how much torque is applied to it. 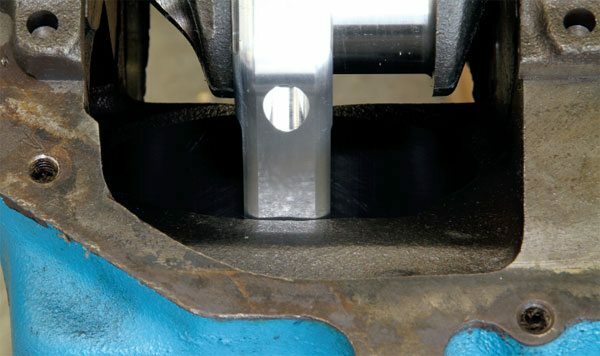 While that’s suitable for fasteners that thread into a blind hole, it’s easy to measure connecting rod bolt stretch during installation to ensure proper clamping load. Many companies offer bolt-stretch gauges, but this premium unit from GRP is compatible with any type of connecting rod. A two-piece connecting rod bolt is very strong, but requires a pair of opposing flanges that create the machined ledges for the nut and bolt to clamp against. The rod is usually thinnest at these points, and that creates weak areas where the rod can fail if pressed to its limits. Pontiac addressed this when designing its cast rod. Additional material around the flanges improves overall strength. Original Pontiac connecting rods use twopiece rod bolts. ARP offers a few different high-performance replacements. Its 7/16-inch replacement is ideal when reusing original SD-455 rods. ARP also offers a 3/8-inch replacement for the original fasteners used with Pontiac’s cast rod. Plan to have your machinist perform the installation, which usually includes light machining or honing. Because aluminum is not as strong as steel, aluminum connecting rods must be bulkier to provide a durability level similar to forged units. Depending upon the amount of crankshaft stroke, some areas of the block (particularly the bottom of the cylinder bore) may need to be relieved with a grinder to gain sufficient rotational clearance. 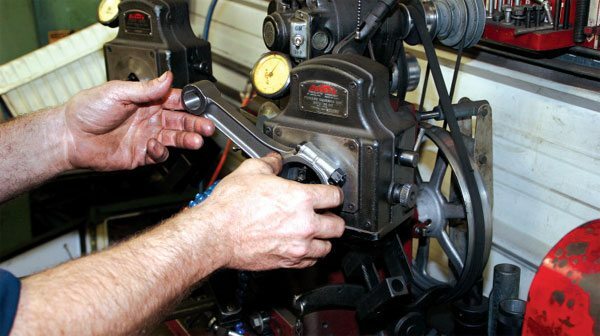 Before placing any connecting rod in service, have your local machinist verify that the crank and wrist pin bores measure within the specified tolerances. In most instances you should find nothing major. Your machinist can easily hone them to the required specification if any small variance is found. 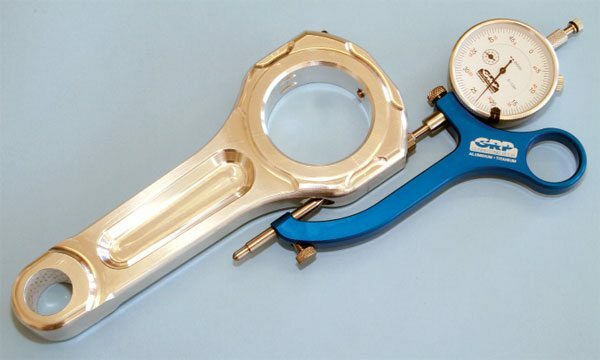 As with each component of the rotating assembly, the connecting rods should be balance matched to ensure they all weigh the same. 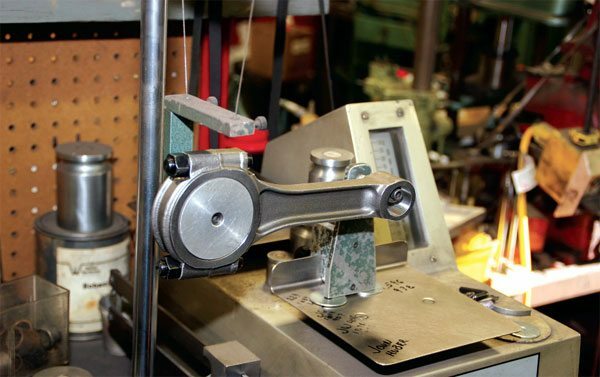 While some machinists simply weigh the entire rod on a scale, better shops have bob equipment that measures both ends of the connecting rod for maximum accuracy. 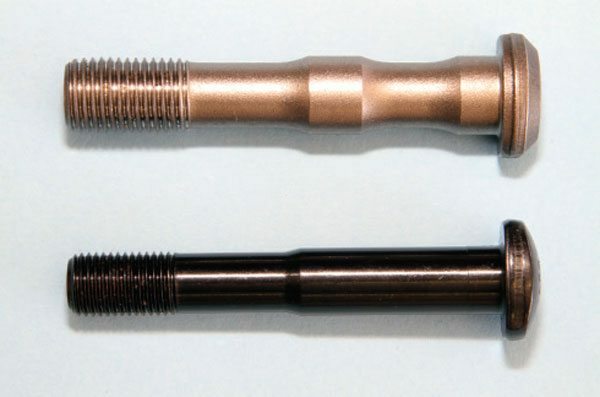 There are two distinct types of connecting rod bolts available today. A thru-bolt type is a two-piece design that includes a nut and bolt. The bolt is pressed into the rod body and the nut secures the cap from the opposite end. A cap-screw type is a one-piece bolt that passes through the connecting rod cap and threads directly into the body. Thru-bolts are common in OE rods and entry-level forged replacements. Cap screws are much more common in aftermarket offerings because they require less space within the rod, maximizing strength, and can be replaced easily. Automotive Racing Products (ARP) is a leader in the fastener industry. It produces a number of top-quality connecting rod bolt kits, and most aftermarket connecting rods are already fitted with ARP bolts. I prefer ARP connecting rod bolts whenever replacement is required. No matter the type, any rod that operates close to its yield strength can fail much sooner than one that’s better designed to handle greater loads. 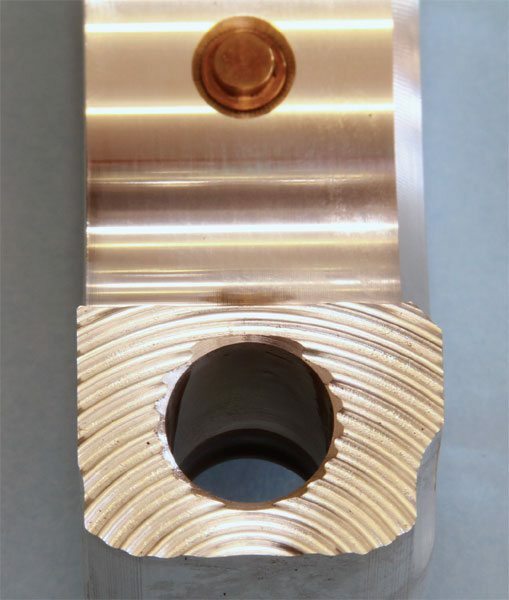 Beyond improper installation or lubrication issues, most failures of an otherwise normal connecting rod are typically the result of an improperly chosen rod for the intended application. You can’t always blame the rod manufacturer or installer if the connecting rod you selected isn’t capable of handling the load associated with your particular engine. With that in mind, there’s generally no harm in using a rod that’s too strong for a given application, especially if you plan to increase its performance down the road. Once you purchase the appropriate set of rods for your particular rebuild, thoroughly clean them and have your machinist verify the critical measurements of the entire set before placing them into service. The critical dimensions should be rechecked each time an engine is torn down for freshening. That includes physically measuring for deformation, bending, twisting, or stretching, and even magnetically inspecting it for cracks. The rod bolts should be measured for stretch and replaced if necessary, and the bearings should be inspected for signs of abnormal wear.